In absence of completed and filed Enrolment Form, GST Portal will not have the details of ‘Authorized Signatory’. In absence of details of Authorized signatory details, the taxpayer will not be able to file any form or conduct any business on the GST Portal after 1st July. Thus, it is very important to have the enrolment form duly filled an filed with GST Portal before 1st of July. Even to opt for composition, the details of Authorized signatory will be required. 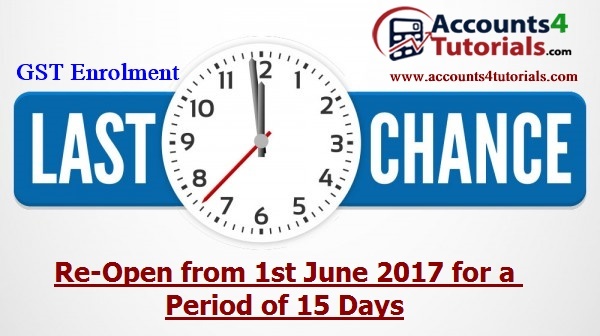 The next opportunity to complete and file the Enrolment Form will open only on 1st July 2017. So kindly avail the opportunity and finish Enrolment process between 1st June and 15th June.